We have a new exhibition in the display area at the rear of the St James’ narthex. It is a set of 30 delightful paintings by our parishioner Janet Young. Come and enjoy the exhibition, and also read Janet’s life story. Janet, having suffered a severe stroke, was befriended by Ann Barlow on behalf of AGE UK three years ago. 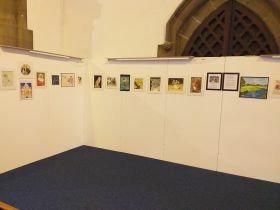 It was Rev Heather, our Vicar who had the lovely idea of putting Janet’s work on show. Janet’s paintings will be in place for several weeks. We have further exhibitions scheduled, and the intention is to always have something on display for visitors and members of our congregations to enjoy. So if you or your group/society are interested in using our exhibition area to display your paintings, photographs or other creative work, please do get in touch with me.